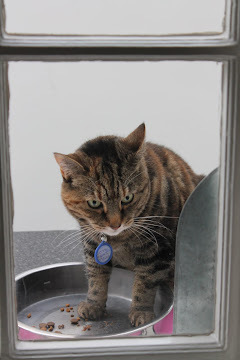 Continuing the project to improve the cats' access to their dinner. Two layers of dated fabric, replaced by a new layer of oilcloth. All part of the grand plan to refurbish the back kitchen/Room of Shame. Watch this space! So, here's a blast from the past for you: remember those pictures in your childhood comic books where you had to spot a hidden object? I'm refurbishing this old step-stool, as it's just what creaky elderly cats need to get up to their above-dog feeding station, and I send my sister a picture, remarking on the little face to be seen in the background. Can she spot the dog? No. I send her a clue: in the doorway. Still no success. Eventually, she gave up and went off to Greece for 6 weeks to lie in the sun; I just hope this hasn't spoiled her whole holiday. but you never know.....I won £50 on my Premium Bonds this month, and about time too, if you ask me; that Ernie is such a tight git. Then today I had an email from the National Lottery entitled "News about your ticket!" telling me that that they have "some exciting news" about my ticket. Excitement wasn't actually my first response: torrents of spam promising me millions have made me an unreachable cynic, but the accurate spelling and the use of my first name made this message seem a little more genuine, so I restrained my automatic tap on the Delete button. Very occasionally I buy a lottery ticket online, after my sister had a major win on the Postcode Lottery - I would post the video of her surprise visit by a tv crew here, but if I did, she would most definitely have to kill me - hoping that her luck would somehow transfer to me; the greed-warped logic of that now escapes me. Also, as a Sagittarian, the least lucky of all star signs, I don't expect to win anything, and am usually proved right. Anyway, after checking that this was a genuine Lotto email and not one of our old scam friends from Nigeria testing my gullibility, I signed in, and found that I had indeed won the lottery. A whole ten pounds of it. Join the dots: freshly baked bread, not quite cool, small slice - just to test, you know - with nice French butter, bedtime, sleeplessness, indigestion, getting up to wander about, more sleeplessness, radio only offering dreary/tragic/depressing stuff, dawn breaking, some dozing, time to get up, visitors due at 11, freshly (well, last night's) baked bread required for lunch, not for me though - insides still protesting - but bread pronounced great success. It's The Baby Over The Way! On March 17th, I mentioned a childhood poem called The Baby Over The Way. Problem-solving Roger, working from home these days, therefore easily distracted, sourced it for me, in an 1980s facsimile of a book of Nursery Rhymes compiled in the 1930s, and the stockist, Stillman Books, based somewhere in British Columbia, posted it to me on March 31st. By surface mail, as the cheaper postal option is known. Glacier mail would have been quicker. For a long long long time, there was no sign of my impulse buy, and the bookseller, Terry Stillman and I began to lose hope. Since March, there has been regular correspondence between Terry and I about what might have happened to this little book, 3 months' transit time seeming a trifle unreasonable. Imagine if I'd waited in for the postman. Eventually, hope faded, and last week I sent a Missing Post claim form to Royal Mail. An interesting form, the International Claim form; read the following sentence as though English was not your first language, and try to imagine what it might mean: Please Note: We cannot entertain any claims of a consequential nature. I then received my returned form with a printed letter of response which in content and tone suggested to me that entertaining any claims at all would be a struggle for the Royal Mail; it indicated that the sender, rather than the intended recipient, who is actually the more injured party in the matter, must notify the postal authorities in the country from which the book was despatched. Silly me, I had thought that my claim form, plus bank statement evidence of purchase, would do, but no. Only liaison between the two juggernaut-like postal systems would do to initiate a search for a mere children's book, lost for more than 2 months. This liaison, perhaps involving many more ponderous and strangely-worded forms, might take centuries, of course, and if Canada Post demanded that communication must be in both English and French, then we, the aggrieved customer, the nameless creator of claim forms, the UK postal system and all, would be well and truly stuffed, as the world knows how poor we are at foreign languages. What's "we cannot entertain" in French, then? See, it doesn't really mean lost post claims, does it. But before I could summon up enough bile-fuelled energy to move on to the next stage of this obstructive process, the book arrived today, its careful packaging in mint condition. And a pretty decent little book it proved too, in good condition, filled with delightful drawings and strange old-fashioned rhymes, which were so familiar I could have been six again. But.... 85 days to travel from Canada to England? Where has it been all this time? What route did it have to take? And, come to think of it, what is surface mail anyway? I read somewhere that no one actually sends mail by sea any more, and that airmail is now the norm. Can this be true? Anyway, I have my book, and might try to post something from it here for your entertainment of the non-consequential sort. Today I went down to the allotment, armed with the pruning saw to deal with the sycamore tree that is smothering our little apple tree. The sycamore grows through the fence separating Suspicious Colin's plot from mine, and there is some disagreement as to whose monstrosity it is, but I have a pruning saw of my very own, donated by the Lovely Son when he sensibly stopped being a tree surgeon, so I guessed it should be my job; I rather like using a pruning saw, not so girly as secateurs, though not so often needed. Now, the sycamore is an unlovely thing, growing as it does through a length of sagging chain link fencing, and it is obvious that over the years other people have tried to tame it, mainly by crude butchery, so I feel none of my usual feeble-minded compunction about sawing branches off it myself. And it was Saturday morning, so the regulars, all the old codgers, would be down there, bored with having nothing left to do on their own immaculate veg beds, and instead spending their time sucking their teeth in disapproval of mine. And various others' as well - I am not the only person who has a scruffy and ill-kempt plot, but, to judge by the reminder notices posted liberally over the site, I might well be the only scruffy person to have paid her rent this year. But there wasn't a soul about. Even Eddie the Poisoner was absent, and living as he does in a high rise tower block, it has to be something special to keep him from his outdoor hobby. Mysterious. Had I missed some wild summer solstice celebration last night, amongst the potatoes and Brussels sprouts, that everyone else was now recovering from? Then I had a long hard look at the whole allotment, and in one of those rare moments of clarity saw what I must do, as an alternative to admitting defeat and giving up half of the allotment altogether. I would stop feeling guilt and despair at my failure to control rampant nature of the ugliest sort, i.e. weeds and slugs, and instead I would grow another crop of green manure in the beds where this year only weeds and stones thrive. This would craftily conceal my failure to have cleared, manured, weeded, dug to a fine tilth (and that's a gardener's dead giveaway, let me tell you - fine tilth says sad person with no social life and a good dollop of OCD....) before the planting season, and I could then state with conviction that I was resting half the plot, and improving the soil at the same time. And green manure is so easy, and grows so fast! Yes, it looks like luxuriant weeds, but only to the uninitiated. The old codgers might be appeased, the rule about two-thirds having to be under cultivation would be obeyed, and I could then put some time and energy into the remaining half of the plot, laying paths, making raised beds with proper sturdy edges, and maybe even relocating the pond once the invisible tadpoles had hatched, to an area that does not have massive trees waiting to drop all their leaves into it in the autumn. I shouldered my pruning saw, called my frisky lamb, I mean, grazing dog, and pootled off home with my scrawny little strawberries and the satisfaction of a Cunning Plan. Next time I shall bring the nails and mend the front fence, which collapsed the other day, leaving the home-made gate looking a little foolish. I might also make a sign for the gate: Beware of the Lambgoatdog. And yuk. And eurgh-nearly-threw-up-there. Lesley's partner John was a manager of leisure centres until recently and was known by her as the Poo Master. Why? Because of the frequency of calls from staff at various centres to report poo found in the swimming pool. Yes, poo. Yes, frequent. No, maybe not all to be blamed on children. Remember that word: frequent. The name for this appalling act is not pooing in the pool, or worse. It's called faecal release. Sounds better, doesn't it. No. Isn't it far worse than petting or bombing? Why aren't there signs to prohibit such a vile act? No Faecal Release Allowed. Offenders Will Be Fined and Have Their Noses Rubbed In It. Now I can add to my many reasons for never wanting to go swimming ever again. In all the clearing out I've been doing, I unearthed this beautiful ocelot jacket that belonged to my mother back in the early 1950s. It dates from a time when no one thought much, if anything at all, about the ethics of wearing fur, and this jacket was much admired. As children, we were occasionally allowed to wear it for a few minutes, and as a treat it ranked up there with the little fur tippets, the kind of collar where the tail was clipped into the mouth, worn by my grandma on high days and holidays. When we lived in Germany, and the dramatic thunderstorms caused electricity cuts, I can remember sitting in it in the candlelit darkness while my mother told us stories. Now, when I look at it, the nostalgia and vivid memories of childhood are overlaid with sadness and remorse that beautiful wild creatures were hunted for their skins. And later in the 60s/70s, many people wore their inherited or charity shop fur coats without a tremor of conscience, until times and attitudes changed, awareness of the rights of animals increased, and, for a long time, wearing fur was to invite the most severe criticism, and sometimes direct action of the paint-throwing kind. I am horrified to read that fur is being promoted again in the fashion industry. But I am left with a nagging question: what do you actually do with a fur coat that you would never, ever wear, and that you (now) deeply regret was ever made? What do I do with an incredibly lovely ocelot jacket, that holds so many memories, is so closely associated with my mother, and feels impossible to dispose of in all the ways I might consider. So far, I have aired it, hung it up properly, and considered a range of options, rejecting them as disrespectful, wasteful, or crassly sentimental, and the jacket remains with me, too difficult to part with, but also difficult to think about. Perhaps I should stop agonising, resign myself to the fact that the past cannot be undone, and keep it for candlelit reassurance during thunderstorms and blackouts. What would you do? Hurrah for Flowers That Have Tried Really Hard. The peony has produced no less than 4 blooms this year, after sulking for several years then having buds that blackened and shrivelled without opening. 4 blooms isn't much, especially in this area where huge and lovely peonies abound, but somehow I feel that hope has triumphed over dry impoverished soil, a million snails, a universe of ants, and a very slack gardener. The clematis has been on Death Row since last summer, when it produced only a few of the tiniest, puniest flowers about 4 feet off the ground; it only survived because I forgot to dig it out in time and it promptly mustered a few tragic little leaves to make me feel like a plant murderess. As it is quite ancient, it has been given a Governor's Pardon for making more of an effort this summer. And Hurrah for me too, for managing to take two photos of things in my front garden without snapping several snails in the process. Happy Father's Day, Magna Carta! This is it - or one of the copies and/or revisions - of the 3rd and final edition. 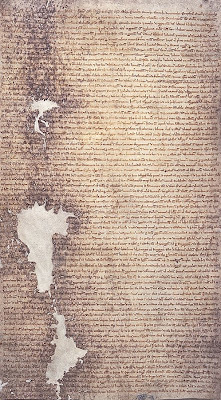 To check out how much you really didn't know about Magna Carta, despite the best efforts of Miss Thingummy the history teacher, have a look at this site. And while we're on, how many of you didn't know that the traditional gift for Father's Day, also celebrated today, is a necktie? No, me neither. I don't really hate young people, even under the sub-group Student, although yesterday's post might have left that impression corroding the milder, more forgiving mind. But the 4th missile/toy of the week had just come crashing over the fence and into my plants, and this rose (seen here in August of another year) had been flattened by a large heavy football. Lhude sing Cuccu - why, why? Time was, round here, when students went home for the holidays, and the rest of the street got a break. Their parents arrived, dutifully loaded filthy duvets and assorted cardboard boxes of prized possessions (skateboards, footballs and frisbees, mostly) into the family car, and took their Pride and Joy home for a few weeks of drying out, nurturing, washing, sleeping, and feeding up. And presumably to steep all their belongings in bleach for the duration. Predictably, the student house would be burgled in their absence, its dilapidated appearance, enhanced by the window ledges decorated with empty bottles and beer cans, acting as effectively as a large sign on the door reading "Laptop, hi-fi and telly in every empty room - help yourselves". Sometimes the burglary went unnoticed for weeks, the house looking no different pre- and post-ransacking. Neighbours muttered about doing some guerilla window-washing and garden-clearing while no one was in the house, and occasionally someone called Environmental Health when the rubbish-filled back yards began to seep unspeakable stinky liquids into the lane. But mostly we breathed sighs of relief that a few weeks' respite could be had before the family cars came back to disgorge plumper, pinker, cleaner young people to start all over again creating slum housing and turn a pleasant area of family homes into Bacteria Gardens, Garbageville. It is different these days. Some of the student houses remain tenanted throughout the summer, so we remain the Neighbourhood That Never Sleeps At Night. One has to wonder what that's about. Why won't they go home? Do they have enough money to pay a full rent all through the holidays, as well as maintain their prodigious alcohol consumption? Or are they orphans? Unloved, unwanted, even disowned by their families? Should we be feeling sorry for them instead of bitter and twisted about them? I have another theory: today's parents have evolved; they have gone for Empty Nest Syndrome as a positive life choice, and denied themselves their traditional role of unpaid servant and provider to their gigantic beer-sodden cuckoos. Instead, they have secured their own orderly houses with sensible locks, packed their pristine belongings and taken themselves off on holiday while Young Cuckoo stays in his/her student house, continuing to foul his/her own nest and drive the hypertensive neighbours demented. Somehow, I can't help feeling that their parents have made the right choice, and hope that they are having a quiet and peaceful summer somewhere that doesn't look like here. Bitter and twisted? Oh yes. I know, a bit of a cliche, and a tune that you can't quite remember either, (no you can't, you fibbers!) but you get my drift. It's been warm and sunny for about 3 days now, and very uplifting for the spirit too, even though sumer could be igoen out again in no time at all. Remember that on June 1st many of us had to resort to full central heating, with socks and vests and woolly jumpers and blowing on our fingers. No wonder we're obsessed with the weather. 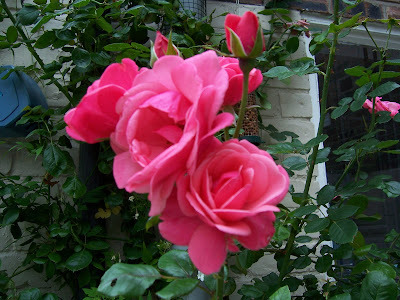 So, the dog and I have frequent little strolls out and about, watch fledglings teetering on branches, sit in the yard admiring the roses in that brief period before blackspot strikes them, and natter to neighbours on the front doorstep. The latest street obsession is how hard it is to park nowadays; the multiple occupancy households, i.e. the easily-identified student houses, are now multiple car households, and attract huge waves of disapproval from the rest of us, mostly, I notice, from those families with more than one car themselves. The cats spend their days comatose and shedding hair on my new white bedding, of course they do. Being a hoarder brings its own punishment with it, believe me. Time for a cup of tea in the sunshine and to count the cars. 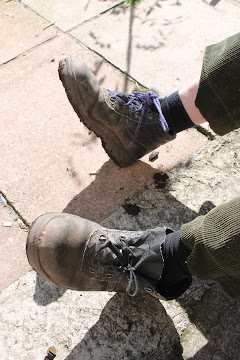 Yesterday was an excellent day for getting down and dirty on the allotment, and that's just what I did. I weeded an entire bed, then part of another, and planted squash, purple-podded beans, and some courgettes that the packet promises will emerge in 3 colours, though I'll believe that when I see it. I could feel the subterranean slugs thrumming with excitement through the soil as I worked on their next garden party fare. After what seemed like hours of digging and planting and watering, with a short break to poke the pond with a stick - yes, a little flurry of activity under the blanket weed, hopefully tadpoles - and a chat with Eddie the Poisoner who has just come out of hospital, unfairly stricken with pancreatitis again, despite having renounced beer and cigarettes for 22 months, and who grudgingly commented that I had made some headway today, I became aware that I should have made more effort to find my water bottle before I came out. If I didn't go home right now to drink copious amounts of water, I could collapse and become a dried and shrivelled husk, to disappear forever amongst the giant nettles and be colonised by all those little bugs and beetles I am constantly fishing out of the water butts. So the dog and I, tongues hanging out most extravagantly, plodded uphill to home, my arms and nose tanning beautifully, my pasty legs and feet hidden from view in gardening clothes and the vilest old trainers you could imagine. Once restored to myself with generous amounts of tea, I contemplated my wrecked hands. Now I'm not vain about my hands, with their stubby nails and papery skin, but these were just disgraceful, and what's more, attached to arms whose tan (yes, I know; almost criminal to have a tan these days) stopped abruptly at t-shirt sleeve level. Not a chic look. The gardener's soap and nice natural bristle nailbrush were duly wielded, and some effort applied. Spadeloads of soil were removed. And did it make much difference? Not a jot. Ingrained dirt and brown fingernails are testament to the folly of getting too close to Mother Earth without stout protective gauntlets; Mother Earth is just a bit too mucky for me. All this cupboard clearing, preceded by a recent visitor, has upset Harry a bit; he has pulled his hair out now and again, and turned up the volume on his mobile yowler. He might look like a sturdy big bruiser, but he's a little tender worrying puss underneath. I have prescribed lots of TLC and carrying him round the house telling him all about what I'm doing and why. In this way, I'm practising to be an old lady who has long rambling conversations with her cats. He likes us to linger awhile by the cat food stocks; this possibly indicates that TLC should read TCL - Total Cupboard Love. Monday marked the date 26 years ago when I moved into this house. It all looked very different then, rather battered after a family with five children and their large shaggy dog had been raised in it, and owners who had enjoyed rather experimental and amateur DIY involving a great number of polystyrene ceiling tiles and determined removal of original features, but it felt like a happy house, and we were young enough then to willingly take on the challenges it presented. I loved my house from the moment I saw it. For 26 years I have had a New Year resolution: This year I will finish this house. The house had other ideas, and I now publicly and formally give in and renounce that misguided resolution. Dear old house, I will continue to improve, restore and care for you, but finish you? Impossible! Rainwater is Kevin's favourite drink. Served in an old paint container, it is the cocktail de jour. It has to be sipped delicately, with both front feet in the water, adding a delicate hint of cat paw essence. After yesterday's glorious warm sunshine, today is very wet. Not lovely Spring showers that leave everything looking like it's had its face washed and is coming out to play again, but heavy, oppressive, persistent rain that gets into your shoes and down your neck and may never never stop.....rain that makes the dog run away home after only 30 seconds of a walk, and that turns the sopping-wet cats into the friendliest creatures ever, wanting to dry themselves against you, while they purr their false affectionate rumbles till their mission is achieved and they can go off to lie on your new pile of ironing. And to make it worse, I have to empty all the cupboards in the back kitchen (aka scullery, utility room, dumping ground, holy place of the matching cat loos, and, chiefly, one of the Rooms of Shame) in preparation for a total revamp at some as-yet-undetermined date. This total revamp will involve the ripping out of old hideous and inadequate wall cupboards, with lots of re-plastering and re-flooring, and replacing them with sleek floor to ceiling cupboards that will compensate a little for the severe lack of storage in this house (where did the Edwardians keep all their stuff??). 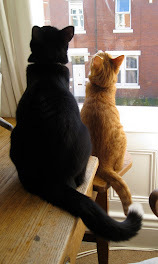 I am informed by project manager Lynn that The Boys will appear soon, all tooled up to transform our homes, and that I have to be organised and decisive before they arrive. The Boys are her Polish builders, whose standard of work is breathtakingly high, and who are planning another few weeks of working for her and for a select few of her friends. Lynn is away on holiday, and will be fierce and frightening on her return, especially towards the unprepared and dithering. Being decisive is even harder, and involves more than mindless moving about of junk-filled boxes. What kind of cupboard doors, handles, tiles do I want? Well, how would I know? So much to choose from! Why did I ever agree to this anyway? What was I thinking? Why can't I just live with the wonky warped floor, the tiny second hand cupboards, the amazing ever-expanding heaps of clutter? If I knuckled down and just drank that huge collection of alcohol, despite the sneezing and the hives, would I even care? But I know what's coming; I shall meekly get on with it, wait for the fierce friend to get back from her holidays, and when it's all over, fall on her neck weeping with gratitude that she rescued me from my own mess. And I shall learn to say, in perfect Polish, at the end of every day, "Can I offer you a drink?"